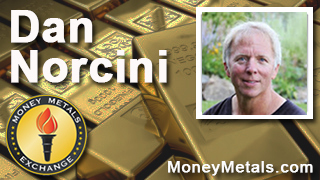 Coming up we’ll hear from Dan Norcini, TraderDan.net, who joins us to help explain the high level of volatility this week in the financial markets, including the Asian stock market crash weighing on global markets, the situation with Greece, and the action in the precious metals markets. Don’t miss my interview with Dan Norcini -- coming up in just a moment. Well another wild week in the financial world brought big swings in precious metals prices. More on that in a bit. But first, here’s the media’s take on this week’s strange goings on. News Anchor 1: A technical glitch shut down trading at the New York Stock Exchange for almost four hours on Wednesday, and while it's still unclear what caused the glitch, the NYSE says it's an internal issue, and not a cyber-attack. News Anchor 2: What will happen to your investments this morning? Market crashes in China, debt debacles in Greece, that and nearly four hour stop at the NYSE yesterday following some kind of technical glitch. All these questions. A lot of questions for investors as symptoms of a global financial crisis continue to mount. Will the euro fall apart? Is the stock market safe? What about your bank? Can your accounts be hacked? When will precious metals markets finally decouple from the financial system and reassert themselves as safe-haven assets? We don’t have all the answers, but I will re-emphasize a point we’ve made before: if you can’t hold it, you may wake up some day to find that you don’t really own it. For the portion of your wealth that you want represented in precious metals, owning the metal in physical form is the only true hedge against the risks inherent in the financial system. Of course, gold and silver are sometimes subject to extreme fluctuations in spot prices that are set by futures exchanges. That was certainly the case this week. On Tuesday, spot silver got slammed down below the $15 level to new lows for the year, shedding more than 7% of its value at one point during the day. By Thursday, however, silver prices recovered to $15.46 an ounce. As of this Friday morning recording the silver spot is still holding firm and currently comes in at $15.51 an ounce, for a weekly decline of 2.2%. Holders of gold didn’t experience quite so dramatic a ride. The yellow metal managed to hold just above its March lows on a closing basis and showed a weekly loss of just a little over 1% through Thursday’s close. As of Friday, gold trades at $1,161 an ounce, now down 1.4% for the week. Whether the precious metals markets can recover from this week’s “glitch” or whether they’ll face more headwinds as the summer progresses remains to be seen. From a technical standpoint, silver could enjoy a substantial bounce off the extremely oversold levels registered this week. From a fundamental standpoint, we are seeing divergences start to develop between the physical market and the paper market. Supplies are tight once again at the retail level. Supply tightness is often seen when low prices attract an influx of buying, and this usually occurs at or near significant bottoms. Some major bullion dealers have reported to customers that they won’t be able to deliver product for a month or longer. One major dealer abruptly suspended new orders. Here at Money Metals Exchange, delivery for most silver products is slightly delayed as a result of a doubling in order volume -- but lead-times are not unreasonable, at least not yet. To be clear, there is currently no shortage of physical silver, but we’re seeing bottlenecks in production. Mints and refiners are struggling to keep up with the crushing demand for retail silver products. The big news in the precious metals this week was the announcement by the U.S. Mint that it has halted sales temporarily on Silver Eagles. As we’ve seen in the past, when the Mint struggles to keep with demand they often stop taking orders all together for some period of time in an attempt to catch up. When word spreads about the shortage of new Silver Eagles, it only increases the public’s demand. Eventually, actual physical silver shortages could emerge at current prices, which are several dollars below the white metal’s mining cost. The crash in the Chinese stock market appears to have caused some forced liquidations of precious metals positions. But market crashes are usually short-lived. The stock market crash of 1987 here in the U.S. didn’t affect precious metals markets much one way or the other in weeks that followed. The direction of the U.S. dollar and expectations for interest rate policy will likely drive sentiment toward the metals among traders going forward. On Wednesday, the Federal Reserve released the minutes from its June meeting. Fed policymakers expressed concern about the situation in Greece and cited the turmoil there as a reason to delay rate hikes here in the U.S. However, the Fed didn’t provide much clarity about when it might move to hike. Policymakers remain divided about whether the economy and jobs market will show enough strength to justify an increase in the Fed’s benchmark rate in September. Don’t hold your breath. To be sure, the events of the past few days in Europe certainly seem to reduce the odds of a September hike. Central bankers around the world will be trying to help salvage the euro as a multi-national currency. The Fed doesn’t want to see the euro go into free-fall versus the dollar. In fact, it doesn’t want to see a strong dollar, period. Particularly when the official inflation rate is running low. As for the fate of Greece, an emergency EU Summit is scheduled for Sunday. There’s a good chance Greece will be booted from the Eurozone and go back on its former national currency, the drachma. The euro project can probably withstand the loss of Greece. Its collapsing economy now represents a very small share of Europe’s total GDP. But central bankers fear that other heavily indebted nations will then follow in Greece’s footsteps. Investors would be wise to brace for more volatility ahead and make sure they aren’t overexposed to the financial system or to fiat currencies. Well now for more on the market gyrations and what it all means to investors, let’s get right to this week’s featured interview. analysis charts cover a broad range of tradeable entities, including the precious metals and foreign exchange markets, as well as the broader commodity world. He's a frequent contributor to both Reuters and Dow Jones as a market analyst and can be found as a source in the Wall Street Journal's commodities section from time to time, as well as CBS's Market Watch. You can also follow his fabulously detailed work at TraderDan.net. Dan, welcome back and thanks for joining us on another wild week in the financial markets. How are you, my friend? Dan Norcini: Hey, Mike. I'm doing well. It's a pleasure to be back. Really good to talk with you again and definitely been a wild week, that's for sure. Looks like it's not over yet, but thank God we got one more day and maybe we'll get back to the weekend. Mike Gleason: Well, we'll get right into it here since there's lots to talk about. Now, from a global market standpoint, Greece and the issues over in the Eurozone are grabbing all of the headlines, and we'll get to that in a moment. But over in Asia, China is facing a stock market collapse that some say could be like their own 1929 crash, and this could have an even bigger impact on the world financial markets than what is happening in Europe. What's your take on the news out of Asia? Dan Norcini: Yeah, I honestly do think, Mike, that China has become much more of a significant market moving event than Greece is. With Greece, I think it was one of those deals where it's been in the headlines for so long, we've been dealing with that issue for months at this point. They're on, they're off. They're on, they're off. They've got an agreement; no, they don't have an agreement. I think you've got a point with Greece where it's almost a trader or investor fatigue with that story. And that's why I think it's actually losing a little of its significance as far as market impact. I think we started to see that. The impact from the Greece election, yes, that was felt, however, it didn't really last that long. I think what's happened there is traders are kind of moving past that and they may have already figured, "Well, if they're going to go, they're going to go. Then to heck with them, let them go." I don't think that's as big of a deal as it was maybe even two weeks ago. Now, as you mention, the focus seems to be shifting to China because the Chinese stock market action is obviously impacting our markets here very severely, particularly our bond market and particularly our equity market, and then as a spill-over, the commodity markets in general. Course, I'm more focused on both the bond market and the commodity markets, mainly because those are the markets that I like to trade in regularly, but I do think they have repercussions for us here in the U.S., especially when it comes to the Fed, Fed policy. That's the thing that I'm really watching carefully to see. I wrote some comments about this today, Mike, on my own blog. I think that one of the things the Fed does, obviously, when they're looking at interest rate policy, monetary policy, they do look abroad. They do look at global events, and they do take those into consideration. Obviously, they're weighing domestic data, they're looking at employment, in particular, but they're also looking at that inflation number for them, a headline number. It's no secret. Most of the central banks around the world here in the west ... the Bank of England has made note of this, the Bank of Canada, of course, the Bank of Japan, the ECB, and the Fed are all talking about a threshold that they're looking at is a 2% annual rate of inflation. What's going on with that situation is that, people are essentially looking at the inflation problem. They're going, "Okay. Well, we don't have any inflation to speak of. We don't have a lot of things that we can point to and say that we're getting anywhere near a 2% rate of growth." Consequently, you're starting to get a line of thinking coming in here that, if the Fed was going to hike, if they were going to raise rates, perhaps as soon as September based on the jobs reports, well that is now throwing in the doubt as well. Simply because of the fact that when China's stock market is selling off like it is, it's having this huge spill-over impact in the commodities sector. Of course, we saw that mainly in crude oil. Crude oil, to me, is one of the key markets I like to look at, Mike, because it's a given. It's one of those deals that where if economy is good, you can generally see crude oil prices stay firm and move higher. If the economy's not doing very well and growth is slowing, crude oil tends to weaken. That's sort of a given. This other market is copper. Copper is another of those bell-weather markets, and of course, copper prices were moving down sharply, which is sort of a proxy for the rest of the industrial or base metals as well. You had energy prices falling as a result of fears about a contagion coming out of China, and then also then you had the base metal prices falling down as well. Well, that spills over into the commodity indexes, whether it's the CRB we used to look at or whether it's the Goldman-Sachs Index or whatever one you want to look at, they all were trending lower and of course, the cost of raw materials are hard assets as they're moving lower, that takes the pressure off the inflation gauge. What happens is, the Fed can point at that and say, "Well, you know, we don't have wage growth like we're expecting that we'd like to see. We don't have wages moving up at a fast enough impact. We certainly don't have pressure upward in commodities or tangibles, so we don't need to be in a hurry to raise interest rates." So that is definitely going to have an impact on their thinking, and so we have to see how these events in China are going to fall out here. My own view is that if the events really begin to spiral very much out of control, if they do start to have a market meltdown ... I mean, they've had obviously a sharp fall in their market, but I wouldn't say we're close to anything like where you're losing 50% of your stock market value yet, but if we were to have something along that line, I would see it having a huge impact on the Fed as far as interest rates go. Of course, anything that would impact the interest rates market is going to impact the precious metals market as well. That's a given as well. Mike Gleason: Given the recent turmoil in Greece and Asia both, just about everyone was expecting to see metals' prices rise, but we've seen the opposite and some are speculating the Asians are selling gold, one of their favorite assets, in a rush for liquidity. Do you think selling pressure in Asia is overwhelming any safe haven bid the metals might of otherwise gotten? Dan Norcini: Yeah. There's two things at work here, Mike. Think back to 2008. I think that's probably the best example that we can point to in recent times. I remember, and you do as well I'm sure, back when we had, at that time, the stock market was at record levels. Crude oil was up near $150 a barrel. Things were flying, and all of a sudden, we had the big credit crisis erupt. I remember, at the time, there were a lot of people scratching their heads, myself included, because we were looking, number one, at gold, should've been functioning as what we would consider a safe haven asset and should've held up pretty well during that down-draft when equities were getting thrown out, the bond market was in turmoil, and the currency markets were in turmoil. Well, of course, we all know from hindsight that almost anything that looked like a hard asset was being thrown out. There were two things going on there. Number one was we had the unwind of a massive leverage Japanese yen-carry trade. Everybody and their mother was essentially borrowing yen at a very low rate of interest and then taking that money and putting it into something else that they could, hopefully, leverage up and get to go higher. Whether it was copper, gold, silver, or crude oil, it really didn't matter. If it was a commodity, it was going higher, and the equities were going up as well. Well, when that started to unwind, then the reverse took place. People began to have to liquidate all those positions, simply because the whole trade was unwinding, and then the computers took over, so everything got dumped. I don't care what it was; silver, gold, copper, crude oil. It was all thrown out, and of course, we know where it ended up going. Gold went to near $680 before we finally got news out of the Fed that they were going to launch their first version to QE1. So what you had, in effect, was a fear, a concern that the unwind, the leverage trade unwind was going to result in huge losses across the financial markets among investors, among hedge funds, etc. and that was going to have a spill-over impact in the broader economy, which is going to produce a very, very slow rate of growth or send many nations into recession. That's exactly what it did. So what traders were, in a sense, anticipating was the jettison of these commodities was a forewarning that the global economy was going to slow, and therefore, demand for hard assets or base metals or whatever you want to call commodities at the time, were going to decrease as well. In hindsight, they were right. Everything slowed down. Everything. Copper demand fell off the cliff, crude oil prices fell off a cliff because the economy came to a halt. I think in one sense, you're seeing some of that, although we don't have, this time around, we don't have the huge yen-carry trade to the same extent that we had back in 2008. What you're still seeing is similar type of action across the commodity markets, Mike. Copper was really hit hard in the turmoil that was unleashed here in China when the market really started moving down over the July 4th weekend. Of course, platinum got hit and palladium got hit. We know what happened with silver; it was obliterated. Crude oil actually fell down. You look at crude oil, a chart of crude oil and what happened to it. It was just working out of trading range. It was kind of moving sideways, but it made a nice recovery off the low back in March around $43. Well, it just fell. It dropped about five to six dollars a barrel over the last week. Huge plunge in crude oil. Of course, gasoline and heating oil, those went down as well. In that sense, you're seeing some of the same sort of reaction. You're seeing people beginning to jettison commodities as a whole, as an asset class, because they're worried that any sort of slowdown in China is, first and foremost, going to crimp demand for commodities; China being the biggest user of these commodities. And then secondly, they're worried about a contagion effect from China spreading into the other nations that do business with it. Of course, then they're worried about the U.S. being impacted, the Eurozone, like you said, it still has its own issues with Greece. They're worried about some of the emerging markets, and all that leads to selling of commodities as an asset class, and that's why you're seeing gold moving down and silver moving down, copper moving down, and the rest of those metals moving down as well. It's that same sort of impact that we saw back in 2008, and what it's done is given rise to a deflationary mindset, once again, where it would look like we might have been finally leaving that behind and maybe starting to anticipate some inflation. Well, that kind of went out with the bath water this week. Mike Gleason: Speaking of the decline in those commodities, and base metals specifically, you point out on your website this week, despite its struggles, gold is actually doing pretty well compared to commodities like copper and even silver. It's outperformed silver; we've seen the gold to silver ratio widen up to, I think, 77 to 1 this week. What do you make of that? Gold is getting maybe some safe haven bid? It hasn't broken down from where it is here. What do you think of that? Dan Norcini: Yeah. That's exactly how I make it, Mike. I mean, yes, it's not getting the kind of safe haven bid like one would expect, which again, is similar to what it did in 2008. It simply did not function as a safe haven very well back then, but again, the same sort of thing is happening now. However, in relative terms, when you compare it to, as you mentioned, when you compare it, for instance, to platinum ... I've been remarking about the gold and the platinum spread and how well gold is doing compared to platinum. You look at gold versus copper or gold versus silver, it's holding up better because, yes, there is still some safe haven money coming in to gold. I happen to think a lot of that is coming out of pretty much out of the Eurozone area because there was obviously some impact from what was going on with Greece we do know. I think if you were in Greece, you would have been smart to buy gold, and particularly, you're going to be buying it in terms of euros. Anyhow, but what were your options? I mean, you were going to put it in what? Keep it in the euro? In what currency are you going to keep it? Maybe you could put it in a dollar, but obviously that would've been good play for Greeks to put some money into gold. There was definitely some buying of safe haven there, however, as you mention, I have no doubt that the very, very big losses that some Chinese investors have incurred in the Chinese stock market that have been severe losses, particularly, Mike, when you consider that the authorities over there were encouraging leverage buying of stocks. That's the thing that really stuck with me when you begin to dig deeper into this. China made borrowing to buy stocks pretty easy over there, and of course, if you're in China, there's only so many avenues that you have to put money. It's hard to move money out of that country because the law that govern money movement in there. You can either put into real estate or you can put it in the stock market. In a sense, it's sort of a captive audience. Well, a lot of those guys leveraged their money up, and so of course, now that leverage is hitting them on the downside, just like it did back in 2008 when the yen-carry trade went upside down. All of a sudden, the power or leverage to inflict harm now is become very, very meaningful and become a painful dose of reality to Chinese investors who really, quite honestly, Mike, had sort of a one-way ticket north. I mean, think about the Chinese stock market, and as I said before, when everything is going up and there's no sign of a top and every day the market goes higher, you look like a genius. "Boy, I can't go wrong. Look at how easy it is to make money. I'm the best trader there ever was." Because everything's going up! You're leveraged up to the gills and that looks fine until all of a sudden one day it stops working. When it stops working, then the leverage begins to work at you from the opposite side on the way down, and now these guys are discovering that. You've got a whole new class of people who have just been educated in the ways of a bear market, so of course, you're going to have margin calls and you're going to have liquidity needs. There's no doubt in my mind over there, that there is gold being sold in China, in Asia, or any of the developing countries that are being impacted by that to help offset losses or possibly even meet leverage margin calls. There might even be some silver associated with that as well, but the fact is there's going to be a movement among investors to sell what they can to raise cash to cover losses. I mean, we see that happen over here in the U.S. We've seen it happen over in the Eurozone, and of course, we'll see it happen over in China now that the market is breaking down. Some of that selling is coming from there, but in spite of that, as mentioned, gold is holding up better than the other corresponding metals, which is a good thing if you're looking for a trade. As I mentioned, there's a way to make some money off of that by taking advantage of those circumstances. Mike Gleason: Turning back to Greece here and what they're calling the Grexit following the recent default. On the one hand, Greece is a tiny economy and some expected limited impacts, but on the other hand, whatever road map they developed for navigating the Greek default is likely to be used in other European debtor nations. There are a number of them lining up behind Greece and the cumulative amount of sovereign debt at risk is simply staggering. Talk about Greece and the fallout that we're seeing now from a trading perspective and then also more on the potential for that contagion. Dan Norcini: Well, the interesting thing, Mike, is that people looking at the impact on the euro, and as a currency trader, I can tell there's really been two definite views in approaching the euro. I mean, we got one side of the coin here saying that a Grexit, Greek leaving the Eurozone, would actually, in the long run, be beneficial for the euro. Of course, they want to buy the euro in any kind of weakness, assuming that Greece were to leave, so they're actually lined up to buy it. The other side of the argument is that, "Well, no, because if Greece leaves then it could potentially threaten the stability of the euro as a common currency and that would be a good reason to sell it." The former view says, "Well, if you get rid of the weak economy in there, the euro might even strengthen." There's been some chatter that while Germany doesn't like what Greece is doing and a lot of German people resent the Greek people ... They consider them, basically, lazy. I'm just trying to tell you what the German view is. They really don't want them to leave the euro because in many circles, among Germans, they are worried that if Greece did leave, the euro would actually get stronger. Germans do not want a strong euro; they want a weak euro so they can export their goods overseas. Like I said, there is an argument to be made that the euro would actually strengthen if Greece were to leave. The flip side is, "Well, okay, what happens then if Spain, for instance, or Italy, takes a look at what Greece does, and they decide to follow suit then too?" Then maybe, perhaps you set the stage for a departure from the Eurozone for those two guys, those two countries as well, or maybe even a third or fourth country. Honestly, Mike, nobody really knows for sure. We have an opinion about it, but when all is said and done, as a trader I have to tell folks, look, I said, we are in uncharted territory. I, personally, have never lived through anything even remotely resembling this. I don't know of anybody on the planet who has, where you have so many major industrialized nations with staggering, enormous sums of debt like we have. Then you had an emerging powerhouse like China, which was growing 9, 10% a year, all of a sudden now looks it's having a credit bubble burst over there as well. We've never seen something of this scale across so many countries at one time in our history, at least in my modern history. I'm not very dogmatic in that sense. I honestly can tell you I don't know which way the euro is going to go. I don't know how this is all going to work out. The only thing I can tell you is that you can't ... you have to stay nimble in a situation like this. You have to let the events unfold, and then you have to watch the markets and see how they react and let the markets tell you how they're actually going to move when all is said and done. Again, we've never seen anything like this. We've had situations in the past where one nation might get in trouble. For instance, we've had problems ... Remember when we had ... Argentina would have a problem. Mexico would have a problem. Russia would have a problem. But the other nations around the world were in pretty decent shape and so, yeah, it had an impact and people moved on it. Remember when the Tiger Nations of Asia were having their share of problems? It was a lot of contagion effect from that. By and large, we came through it simply because the other nations were in pretty decent shape. Well, now, if you look for a hotspot around the globe, you can point to and say, "That country really has got its economic act together. They're doing wonderful. They've got manageable levels of debt, there's no credit excess. There's strong growth there." I don't know of any such thing. Do you? The problem is, we don't have that situation where we can have maybe one solid nation pull us out of this because we're all floundering around out there. Like I said before in other interviews, for all the problems that the U.S. has, and granted, we have plenty of them, compared to some of these other nations, we look like a shining star on a hill somewhere, shining city on a hill, I should say, compared to some of the other problems which doesn't really tell you a whole lot about what we're dealing with in globally. That's how bad things could be out there considering the amount of debt and the global slowdown that could occur. Mike Gleason: Yeah. Tallest midget at the circus, I like to say. I think that's another good, descriptive analogy there. As we're talking here on Thursday evening, we're seeing the metals just bounce along the bottom this week, but they haven't totally broken down below last October's five-year low. Silver even rebounded a little bit here today, and meanwhile, we have built up some significant positions in the Commitment of Traders Report in recent weeks. Do you see any type of set-up there that could indicate a bottoming and possibly a reversal or all these other factors that we've been talking about likely to drag them lower? Dan Norcini: Well, let me start off with gold first, Mike, and say yes. We are getting a fair number of shorts among the hedge fund category, which is what I like to focus on among the larger speculators, that are beginning to be built up. That being said, and I try to make a point of saying this anytime I talk about the Commitment of Traders, whenever we look at these things, the Commitment of Traders is simply a snapshot of a market at any given time. I tell people, never read too much into the COT report. It's certainly not the holy grail of trading. I've been doing these things for, gosh, over 25 years now. I can tell you that the Commitment of Traders has its uses, but if it were a holy grail of trading, and understand the Commitment of Traders were the instant way from rags to riches, I guarantee you I would've discovered it a long time ago. It's just another tool in the toolbox of a trader and an investor. When I say all that to preface this: essentially, we do have a potential for a short-covering squeeze in the gold market. The potential is there because you have a large bill of shorts and not just in gold. That would be in any market, Mike, that accumulates a sizeable amount of shorts. Short-covering rallies are very ferocious, very vicious. The speed at which shorts can come out of a market is mind-boggling because it's total panic whenever shorts cover simply because you don't know how high a market can go. You know how low they can go; they can go to zero, and that's it. It's not going any lower, but as far as the upside, you never really know how far it's going to go. Short-covering panics are quite remarkable in the amount of price action that they develop. Again, the thing is though, you need a trigger. You need something that would actually take a group of traders, who are very confident in their position, and you have to begin to interject doubt or uncertainty into their mind. As long as the market is moving in their favor or as long as a bounce higher is weak and it's not sustained, it fades relatively quickly. The bears are full of confidence; they are brimming with confidence, and they're rather complacent, I might add. In order to startle them, you need to have something that produces a move higher, that trips a key overhead technical resistance level. Then, and only then, do you have the situation where the potential short-covering rally becomes an actual short-covering rally. The problem is as traders or investors, we don't know how large a short position can get before it reaches that point. We just don't know. It's the same thing on the upside. People used to rattle all the time about, "Well, you know, there's a lot of people on the long-side of the gold market or a lot of people on the long-side of the silver market. We're due for a reversal." And my comment was, "What for, and how do you know?" The answer is, they don't know. The reason being is because nobody knows how high a market can go, and nobody knows how large a position becomes before it becomes too large. You just don't know; you really don't. What we have to do is we have to watch technical levels. In my mind, as I look at a gold chart or I look at a silver chart, if I see a technical level that looks formidable, and that technical resistance level is broken to the upside, and there's a lot of shorts in that market, I can say pretty much with certainty they're going to come out of there. Again, that's what we would need in order to see a short-covering rally in gold. We certainly would need the same thing in silver as well. The question then, Mike, also becomes is would such an event actually trigger a change in trend, or would it simply just be one more upside rally in an on-going bear market? That, again, has to be determined by the price pattern that sets itself up on the chart. Mike Gleason: Well, as we begin to close, expanding on some of those technical levels, what are you looking for in the gold market? I guess we'll start there. Support levels, resistance, what are the technical analysis? What is the technical analysis that you do showing you there? Dan Norcini: Okay, yeah, let's start with the gold market, Mike. Gold has been traded, prior to essentially the events of China and let's say even Greece over the last week, week and a half. Gold has been moving in a sideways or a range-trading pattern going all the way back to the middle of March this year. We basically were working back and forth between $1,225 or so on the top of that range and down on the bottom around $1,175, so we're essentially in a range of about $50, Mike, back and forth for about three months. People would get all excited when it would rally up to about $1,215, $1,220, and the break-out's coming, the break-out's coming. Well, lo and behold, it would hit the top of that range, around $1,225, maybe pop through a little bit, and then back down it would come. Then the bears would get all excited on the downside, "Well, it's going to break down" and it would go down to $1,175, and sure enough, it would bounce and go right back up again. For three months, it kind of went nowhere. It just moved back and forth in the range and consolidated. Well, it broke down below the bottom of that range in right around the first of this month, the week of the July 4th holiday. It fell down below that range. Interestingly enough, and I think as a trader something I pay attention to, it had trouble getting back up into the range. Now, that's something that piques unnoticed when a market has been doing that for so long. When anything is in a pattern, Mike, and that pattern is broken, that makes me pique. It makes me pay attention, it piques my interest. What happened was, gold fell down below that support level, let's call it roughly between $1,175 and $1,180, and it tried to pop back up there. I guess it was the second day of July, something like that, Tuesday or whatever it was last week. It couldn't do it. It moved up there, and it attracted selling. Well, now, what it's done is, it's fallen away from $1,175, and it's moved down to the next level of support, which is right around $1,140, give or take a few bucks on either side of that. It looks like, for the time being, now it's trapped in a range where it's moving between maybe $1,170, $1,175 on the top and let's call it $1,150 to $1,140 on the bottom. So the range has tightened up a little bit. It's maybe about a $30 to $35 range, but it's moving sideways. The thing here to watch for people who are fans of gold is very simple: you've got a low that was made back in November this year ... I meant, excuse me, of last year, which was a big low, that was down near $1,130. Back in middle of March, right around the Ides of March, we were down close to there again; we were at $1,140. That was a double-bottom down there. Very solid support emerged down there, the market moved back up there. Now, it didn't go ricocheting sky-high, but it did rebound from there, signifying that there was some pretty strong buying at that level. Now gold is moving back down toward that previous level, so the question we have as traders, investors, or anybody interested in buying gold would say, "All right. If it does go down to that area, around $1,140 or so, are the same buyers who made their presence felt so strongly back in November of last year and again in March of this year, are they going to return to the gold market and are they going to buy in size like they did back then, of sufficient quantity, that they'll be able to push the market away from there?" or has something changed in their mind and will they step back and allow that market to go lower, in the hopes that they can pick it up maybe $50 cheaper, maybe get it down around $1,100 or slightly below there? The answer to that question is, we don't know. We really don't know yet. We're watching it. Now gold did go down there this week. We'll have to see how this thing closes tomorrow. A lot's going to depend on what happens in China tonight or in their Friday morning over there and how that thing closes. That might give us an indication on what gold will do. Mike Gleason: Let's turn to silver real quick before we wrap it up. What are you looking for there? Dan Norcini: Okay, well, situation in silver, as far as the price pattern, very similar to gold, Mike. Little bit uncanny how similar it is, because you got, back in November, then again in December, you had silver down around $15. Remember in the first of December, it actually spiked below $15, went almost to $14, $14.20 before it rebounded, and that was the bottom at that time. Then, back in the same time frame as gold made its bottom around $1,140 or whatever it was, silver made another bottom in March. We were down in the bottom of that range and silver was working right around $15, about $15.25, then it rebounded and moved up above $17, then eventually moved back down in a range, popped back toward $18, and down she came again. Now, you're looking at a market that's essentially been in a very broad trading race going back to, actually, October of last year. This price has moved between $18 on the top, let's call it $17 to $18 on the top, and $14 to $15 on the bottom. The range has been 3 to 4 dollars, however you want to start. Well, we're down toward the bottom of that range, we went down below $15 briefly, we popped back up again. Okay, that's the support level. That's where it's held in the past. Now, the question is, does silver have enough oomph to it where it can get back above $16? If it does, now in my mind, that would confirm that range is still in effect and you could expect to see the price move up maybe back towards $16.75 to $17 on the upside. If it stages one of these weak up-moves, like gold's been doing. It's just an absence of selling and not concerted buying, you just get a weak retracement higher, then you might see another fresh leg going down there recast that area below $15 again. I can tell you that, from a trading perspective, that you would not want to see silver have a strong close below the $15 level. I would not want to see it down below, let’s call it $14.80, $14.85, somewhere in there. If it were to close down there, I think you're going to see a press. These guys are going to try to press it to $14 to see if they can take out the bottom of the range, but whether the buyers would show up there or not. As we move forward, that's our parameters, that's what we would watch for, Mike. Essentially see, is it going to hold here, and can it recover to get to $16 at least and stay above $16, or is it going to fade and run back below $15, set up a test for $14 again? Mike Gleason: Well, Dan, I really want to thank you for your wonderful insights as always. It's great to talk to you, and thanks for taking the time to speak with us, and helping us explain to explain all of the madness. I hope you have a restful weekend. Dan Norcini: Well, thank you, Mike. It's always a pleasure to be with you, and I think you summed up really well. These are very, very volatile, uncertain markets, Mike. I tell people at the website all the time, "Look, you have to be careful in markets like this." There's not a lot of conviction on either side, Mike, bull or bear, because events are changing so quickly and the impact from the computerized trading is so drastic that the move of one day can be reversed the next day or two days move can be reversed in one day. There's just that sort of volatility in the markets right now. Traders need to be careful out there, investors, I would say also. Do not make long-term decisions based on day-to-day market action. Use a weekly chart. Look at something that's an intermediate term chart. It filters out a lot of the noise that you get from the short-term gyration, gives you a little bit better perspective, a longer term view of things, and that way you can watch all the gyrations. They're interesting, but don't let them inform your investment decisions. That would be a bad mistake to do that, Mike. Again, thanks for having me, always a pleasure to speak with you, Mike. Mike Gleason: Well, great advice. Well, that will do it for this week. Thanks again to Dan Norcini. If you want to check out the fabulous market commentary and technical information that Dan puts out, just go to TraderDan.net. Check back next Friday for our next weekly wrap podcast. Until then, this has been Mike Gleason with Money Metals Exchange. Thanks for listening, and have a great weekend everybody.